This main page was last updated on 15 February 2016. All other pages are independent of this one and are updated more frequently. The pages marked below with "NEW" have been updated since 1 February 2016. Hopefully you are hearing music right now and if you are wondering what music you are listening to--it is called "Whaler Song" and was probably played aboard old whaling ships. "WELCOME TO MY WEB SITE"
Whenever I am home I raise my Colors. 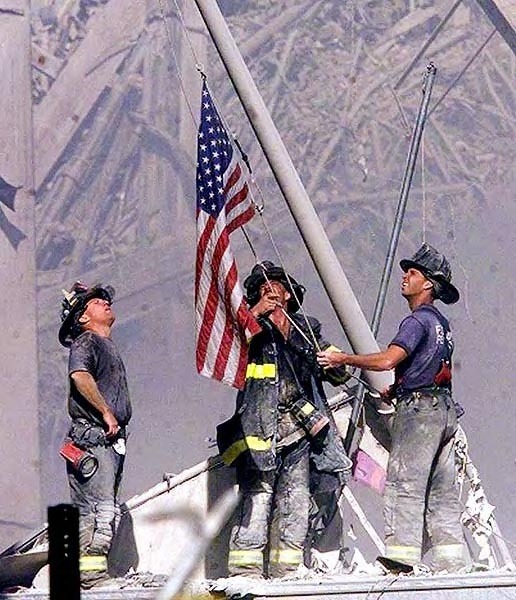 Following the World Trade Center and Pentagon attacks a photo appeared in many places of the firefighters raising the Colors at what has come to be called Ground Zero in New York City. Thomas E. Franklin, staff photographer for "The Record" in Bergen County, New Jersey took this amazing photo and I want to post it here so I hope I don't get into any trouble for doing so. This photo has certainly captured their patriotism. Before I go any further I would like to invite you to visit a very special site dedicated to the thousands of men and women affected by 11 September 2001. Please go to We Will Never Forget sponsored by the Kenilworth Veterans Center and VFW Post 2230 in Kenilworth, NJ. Unfortunately the TRIBUTE page is not always up as they claim it costs to much to keep it active all the time. I am doing some more editing on my remaining two domain sites. You can now visit me here or at Colonel Maggie but Tales and Whales Publishing will be going offline although most of the info on that site will be moved over to this one soon. I'm trying to cut down on my workload so please bear with me as I make these changes--thanks. Hopefully there will be no duplications when I'm finished. Meanwhile please keep coming back here to find out what I'm doing. AND please visit LangMarc Publishing which owns my first two books. IN MEMORY -- is dedicated to some of the women and men I have known who have died. IRAQ -- is dedicated to the American women who died while serving our country in Iraq or near-by countries during Operation Iraqi Freedom. AFGHANISTAN -- is dedicated to the American women who died while serving our country in Afghanistan during Operation Enduring Freedom. OTHER AREAS -- is dedicated to the American women who died while serving our country in other areas of the world since Desert Storm and 11 September 2001. 11 SEP 01 -- is dedicated to all the American women (and one man who I personally knew) who died when a plane hit The Pentagon on 11 September 2001. OKC -- is dedicated to the American women who died when a bomb blew up the Murrah Building in Oklahoma City on 19 April 1995. DESERT STORM -- is dedicated to the American women who died during the Gulf War of 1990-1991. VIETNAM -- is dedicated to the American women who died while serving our country in Vietnam. EARLIER WARS -- is dedicated to the American women who died during the Korean War, World War II, World War I, Spanish-American War and Civil War. SCHEDULE -- is my TENTATIVE TRAVEL SCHEDULE for the next year. If your interested in requesting my services please contact me. LINKS -- go to many sites dealing with the military, women, miscellaneous, adoptions, Fire & Emergency Medical Services, GLBT and graphics. BOOKS -- are those that I have read and think that everyone should read to learn more about the women or men who have served our country. I've written reviews about several of these books and they are now available for you to read. MOVIES -- are those that I have seen--though many are fictional in nature--they are somewhat based on fact. I've also written reviews about some of these movies and they are now available for you to read also. NOONIE -- is where you can learn more about my background. BUDDY SEARCH -- lists people that either other people or myself are looking for. If you are searching for someone, let me know and I'll add you to my listing. If you find a friends name already listed, let me know how to reach them. ORDERS -- you can print out this order form to get autographed copies of my books direct from me. AWARDS -- you can see the awards I've received both personally and online for my website. POW-MIA -- is one of my other passions, keeping up on the POW-MIA issues. Here you will also find information about some of those folks who are still unaccounted for. LANGMARC PUBLISHING -- is where you'll find more inspirational books, non-fiction books, novels, children books, and young adult books. PHOTOS -- are pictures of events I've been to, some of my friends, some Veterans I know, my tribute to the cast of "Tour of Duty," my homes, my pets, etc. WHALES -- now you too can see my love of whales. THREE HEROES -- are my friends who went to Vietnam. WEB RINGS -- I belong to are on this page. COLONIE VETERANS MEMORIAL -- now you can see the project I worked on over the past few years. NOW--if you don't know me, I am a woman who just happens to be a retired Army Reserve First Sergeant. I share my experiences and expertise in researching, writing, finding a publisher, and "hitting the road" with my books Memories of Maggie--Martha Raye: A Legend Spanning Three Wars, Potpourri Of War: Labors of Love Remembered, The Sarge's Thoughts: Volume I thru VI, Mom Wears Combat Boots, Dad Wears Combat Boots and Women At Risk: We Also Served. I communicated with Maggie from 1988 until her death in 1994. I came to know and love her. I was privileged to visit her several times in her Bel Air, California home, where I enjoyed her comments as we watched her old movies and television programs together. I listened to her stories, reminisced, and visited with this remarkable woman about her beloved frontline soldiers. Both in my book Memories of Maggie (which I sometimes refer to as MOM) and during some of my speaking engagements I paint a picture of the most intriguing woman of our time. A superb jazz singer, Martha Raye's comedic genius and her brilliant acting will long be remembered. But her most awesome gift was her devotion to entertaining frontline soldiers in World War II, Korea, and Vietnam. She donned fatigues and a Green Beret. She would head into territory where no other civilian would consider visiting. She had a photographic memory for recognizing each soldier years after meeting him or her. My book centers on the woman I came to know as Maggie and her personal mission with the troops rather than on her chaotic personal life. I compiled pictures offered by hundreds of Maggie's admirers and collected stories about this endearing woman. Some of those pictures can be found by visiting Colonel Maggie or reading my books. Memories of Maggie covers her entire life from birth to death. It talks about her family life, stage performances, radio, movies, records, albums, TV shows, and most of all her devotion (regardless of branch, rank, gender, religion, or ethnic background) to our Armed Forces personnel. It also discusses the long, tedious process it took the committee I spearheaded to get the Presidential Medal of Freedom awarded to her. You can learn more about her by visiting Colonel Maggie where there are many links to other sites devoted to her. Meanwhile if you are interested in an autographed copy of my book go to Orders to find out how. If you knew Maggie please e-mail me here your memories of this great American patriot. Many people asked if I would write another book. My answer was "Yes" I would. As a matter of fact my second book Potpourri Of War (which I sometimes refer to as POW) was released by LangMarc Publishing in 1998. It was kicked off officially on Flag Day (14 June 1998) in Massachusetts following the groundbreaking for the Seekonk Vietnam Veterans Memorial ceremony. During that kickoff POW sold more books in one hour than two of the New York Times best sellers did during that whole week in the Seekonk/Providence, Rhode Island area. I think that's quite an accomplishment. Potpourri Of War includes some of the things I had to cut from Memories of Maggie (that is one reason LangMarc agreed to publish it) as well as my experiences since MOM was released. It shows how Maggie changed my life and includes some historical facts about other "not-so-famous" people who worked with the USO-Red Cross-Special Services that you can learn about. There is also information in it about the Women in Military Service to America (WIMSA) Memorial dedication, the Gold Star Mothers, the Kent State shootings, Vietnam, what it took to get MOM published and promoted, as well as many other women and men who served our country. AND silly me, I wrote a third book: The Sarge's Thoughts: Volume I released in March 1999. It is only available from them or direct from me. It contains articles that I wrote during 1998. Since then I've had Volume II - V published. They are available direct from me. They contain articles I wrote between 1999 and 2005. These volumes came about thanks to Dale Smith, the webmaster of several websites, who suggested that I put the articles that I have written for one of his sites, newspapers, magazines, etc into a book for others to read who might not normally see my writings. I completed two children's books, Mom Wears Combat Boots and its twin Dad Wears Combat Boots and one about women who served since World War I that is titled Women At Risk: We Also Served (which I sometimes refer to as WAR). All of these books are available and you can get them autographed as well direct from me. The children's books are written in a simple manner for kids 5-10 years of age to explain a little about patriotism, family history, military equipment and training, and how it all affects families. The books are identical except for the covers, dedication page, and the wording changed from Mom to Dad. THESE BOOKS WOULD BE GREAT GIFTS FROM ANY PARENT OR GRANDPARENT TO SHARE WITH THEIR CHILDREN AND GRANDCHILDREN. Comments from American Legion personnel, retired and active military personnel, and former Congressmen about these books have been very good. Women At Risk profiles more than 60 women who served our country either in the military or as civilians during peace and/or war time. This is the first time many of them shared their experiences, some funny--some sad. It is an opportunity to read about some of the things they did and the places they went. This is available direct from me and can be autographed copies. Meanwhile I'm working on several things including my own autobiography, another book about my travels and the people I've met along the way, and possibly another book about more women I've met who have served our country and maybe Colonel Maggie. People have said Memories of Maggie needs national attention and publicity. Likewise, Potpourri Of War and Women At Risk should have it too. If you know how I can get some, please let me know. Unfortunately I don't have an agent or publicist. Any ideas will be welcomed--just drop me an email message. Please check back often to see the changes I've made. Some of the icons and graphics on my pages are from The Clip Art Warehouse. They offer free clip art to everyone. I also borrowed some from other sites with the web-owners permission of course. You can find those sites by visiting my Links page for Graphics. Use the buttons above, on the left or below to go to another page. Copyright 1996-2016 by Noonie Fortin. All rights reserved. This page was last updated on 02/15/16.